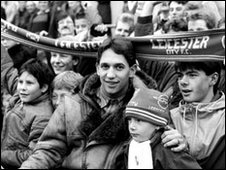 Leicester City fans are calling for the club's former stadium at Filbert Street to be redeveloped. The ground was meant to be built on after the club moved to the Walkers Stadium, but plans have been put on hold due to the recession. It has been derelict for seven years and is now a dumping ground for rubbish, local residents said. Ian Bason of the Leicester City supporters group said a club museum would be a good use for the site. "I would like to have a museum on Leicester City FC on the site or a recreation ground for the neighbourhood," he said. Leonard Cook, who lives near the site, said a 2003 letter said residential development earmarked Filbert Street for 141 flats. "It is now a dumping ground overrun with weeds and fences bashed down. Townhouses or flats would be a good idea," he said. Downing Development, owners of the site, said it is waiting for the property market to stabilise before putting forward more plans for the site. "We look forward to building on the success of the student village we have already delivered at Filbert Street with a development that will benefit the local area," the firm said. Some residents have called for a car park on the site to provide spaces for visitors to the nearby Leicester Royal hospital.